Welcome to the PenStars quick-start user guide. This page explains how the system works and how to use it. IMPORTANT: the “Create Submission” option creates a NEW article. Once your submission has been rated, use each article’s EDIT button (on your Dashboard) to resubmit for the second and third assessment cycles. To use PenStars, you must first register and log in. Registration is simple: provide a user name and email, then click the link in the email you receive to confirm and set your password. Logging in is just as easy: click the “Log In” link in the top right, or the hamburger menu then “Log In” if you’re on a small screen. Your PenStars dashboard is your control centre. It shows all your content and lets you filter, sort and show fewer or more items per page, to suit your needs. The site works out your desired sorts and filters by passing parameters in the page address. That means you can set everything up how you like it, then bookmark the page. Every time you visit your bookmarked page, you’ll see your latest content sorted and filtered in the same way. Over on the right (or at the bottom if you’re on a small screen), you’ll see a summary widget that shows your name, your account balance and your current content status. This widget appears on virtually every screen. You’ll need funds in your PenStars account before you can submit content for assessment, unless you’re lucky enough to have one or more free submissions. 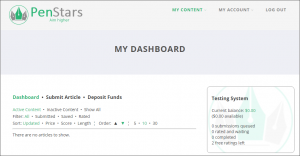 Click the “Deposit Funds” option from the My Content menu or the Dashboard. Pick the right deposit for your needs: if you’re just starting out, the smallest offers the opportunity to try the system. 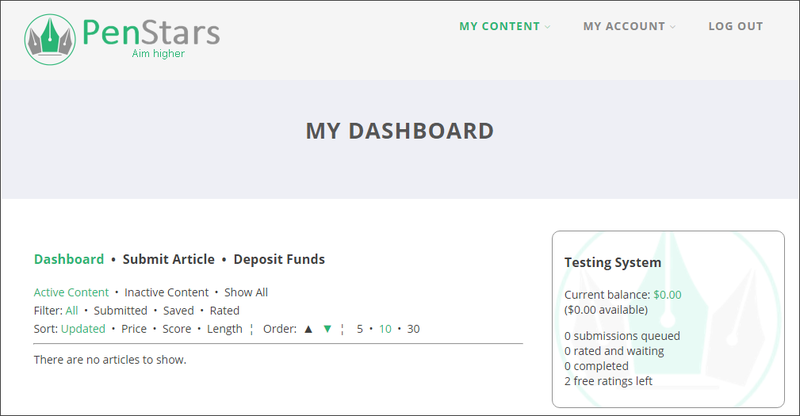 For high-end freelancers, big businesses and publications, a bigger deposit means you can quickly send a ton of content for expert feedback! Note that PenStars only accepts PayPal payments at this time. Now the serious work begins! 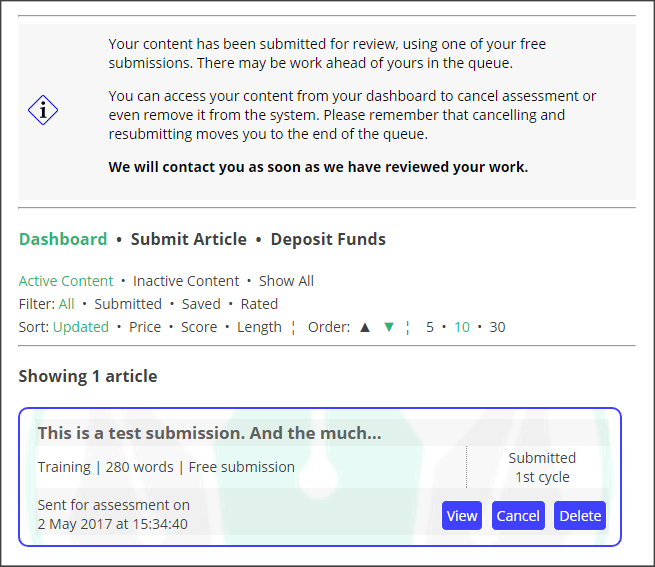 Click the link in the My Content menu or on the Dashboard to submit an article for assessment. All content submissions use the same simple form. We don’t accept document uploads because it encourages spam. Paste your content into the editor. You can format it or paste plain text – we don’t mind! 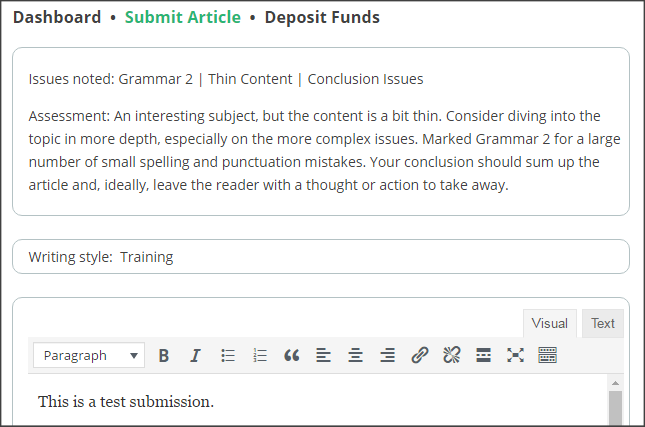 It’s important to tell us your writing style when you submit, so we can adjust our feedback to fit. For example, technical writing has very different standards to clickbait web articles. If the exact style isn’t listed, pick the closest one. 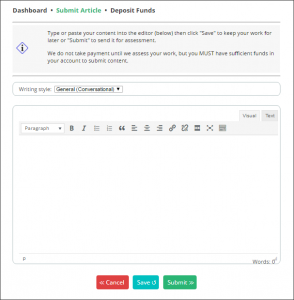 You can now either Save or Submit your work. Saving stores the article for later. It appears on your dashboard and you can edit it, delete it or send it for submission from there. Submitting sends the article for expert assessment. 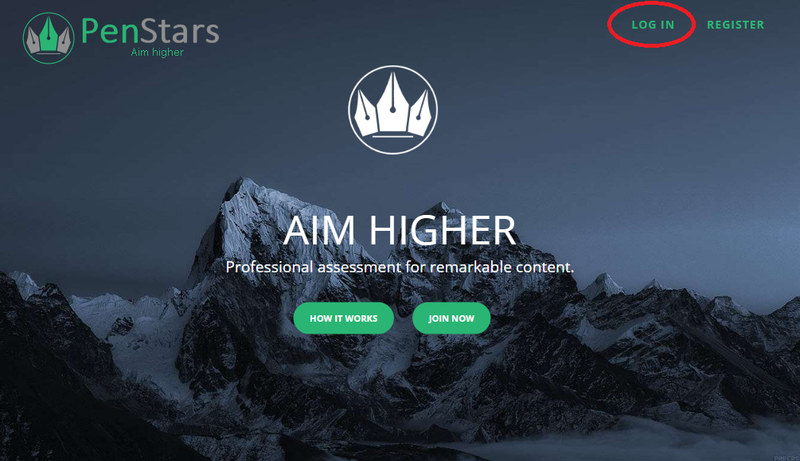 You must have sufficient funds in your PenStars account – if you don’t, the system will tell you and save your work for later (so you don’t have to redo it). 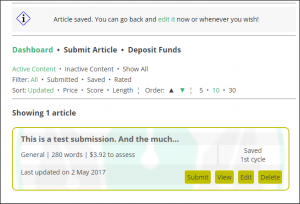 Whether you save or submit, the system will put a title on your work (the first few words) so you can tell what’s what, count the number of words and show how much it will cost for assessment. The last update date is also displayed on your Dashboard. When you submit, we take the money to pay for assessment and hold it in escrow. PenStars works in “cycles”. When you submit content, you start the first cycle. Our experts assess your work and offer feedback. That’s the end of the first cycle. 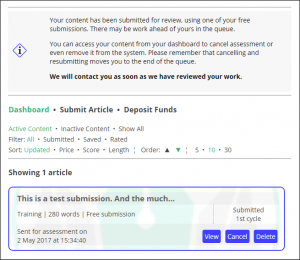 You can update and resubmit your content twice – the second and third cycles – and get feedback each time. 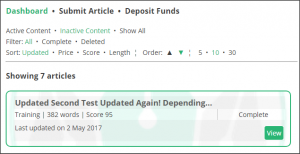 You’ll receive an email notification when your content has been assessed, and you’ll see it marked as “rated” on your Dashboard. 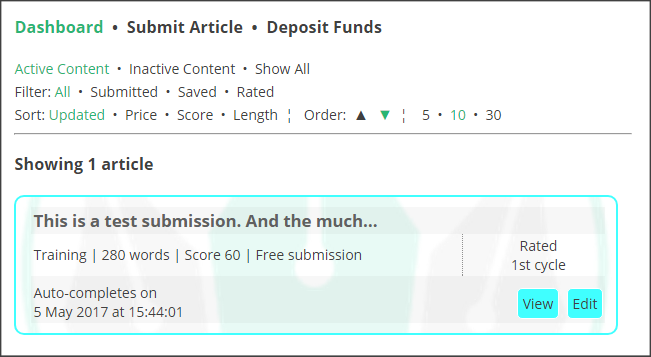 Click the View or Edit button on a rated article to see your score and assessment. 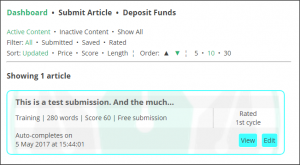 The score is a rough guide to the overall quality of your work, based on our rating system. Each issue is shown in a short list above your content, so you know what needs correcting. However, the most important part of the assessment is your expert’s feedback – detailed commentary intended to help you create better content! 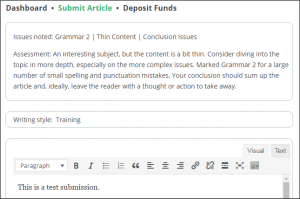 Unlike the first time you submit, you cannot resubmit an article without using the Edit option. 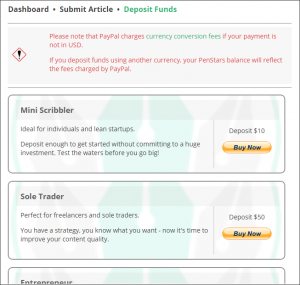 You’d be wasting your money if you resubmitted without changing anything! Click Edit on your Dashboard. 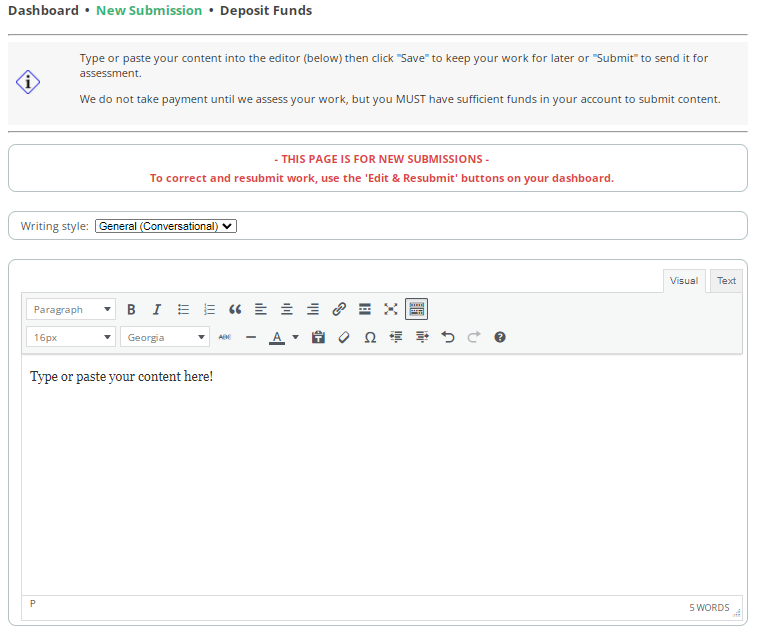 Just the same as when you originally submit content, you can Save or Submit from the editing screen. Saving your content keeps it in your active list until you’re finished changing the article; submitting sends it immediately. We wait three days after each of the first and second assessments for you to update and resubmit your work. 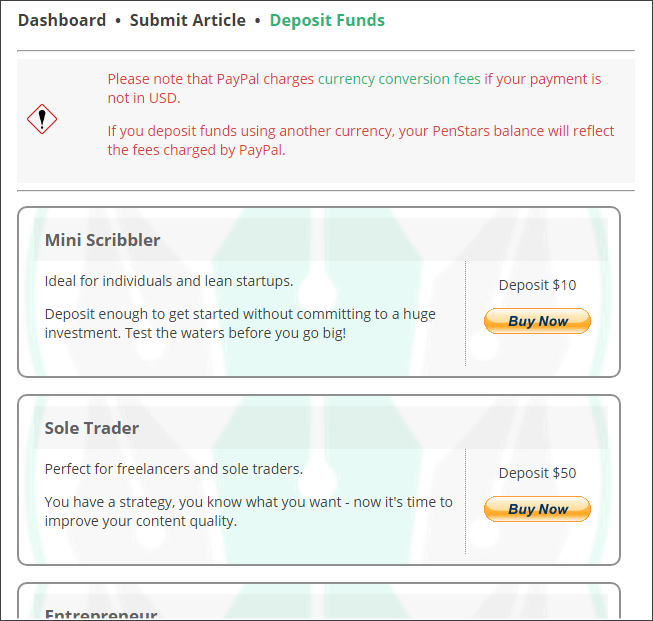 You can check the deadline on your Dashboard (and the system date/time in the widget on the side or at the bottom). Our system will automatically complete the task and pay your assessor if you miss the deadline – don’t get caught out, especially if you save your work for later! 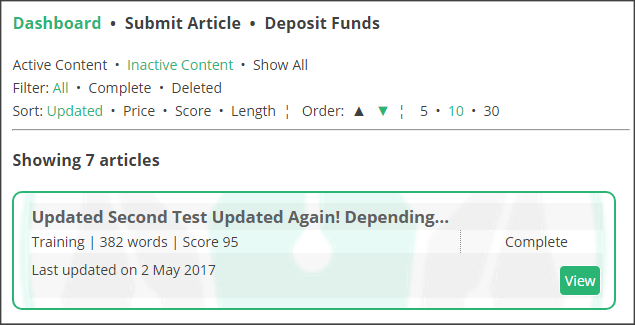 When you’ve received your third assessment for an article (or missed the resubmission deadline), the job is complete and moves to your “Inactive Content” list on the Dashboard. We pay your assessor at this stage, with the funds in escrow. You’ll see the transaction on your Account History page.